South Carolina is known for its rough and tumble politics, and Saturday night&apos;s CBS News debate in Greenville, S.C., certainly held true to that characterization. It was the most vicious and unruly debate yet this cycle, prompting moderator John Dickerson to even interject at one point that he was "going to turn this car around!" Real estate magnate Donald Trump and former Florida Gov. Jeb Bush sparred early on about 9/11 and George W. Bush&apos;s foreign policy, with Trump using what are usually Democratic attacks on the former president in going after him for the Iraq war and his inability to prevent the September 11th terrorist attacks. Florida Sen. Marco Rubio and Texas Sen. Ted Cruz threw elbows over immigration reform and Trump got in some jabs against Cruz, his frequent foil, too. Here are some of the top moments and takeaways from the debate. The sudden death of Supreme Court Justice Antonin Scalia on Saturday afternoon and subsequent opening on the bench started the event on a somber note, but quickly turned to the political question at hand — should President Obama be allowed to nominate a new justice in an election year? All the candidates sided with GOP congressional leaders, who said earlier that any nomination to fill Scalia&apos;s vacancy should happen under a new president, putting them at odds with Democrats and the White House. "I think it&apos;s up to [Senate Majority Leader] Mitch McConnell and everybody to stop him," Trump said. "It&apos;s called delay, delay, delay." Ohio Gov. John Kasich decried the partisanship in the country, saying he would bring the country together as president. But he admitted that, "I believe the president should not move forward, and we should let the next president decide" on a replacement. Rubio said a new GOP president should appoint someone who would "put people on the bench who understand that the constitution is not a living and breathing document — it is to be interpreted as it was originally meant." Cruz sparred with Dickerson over whether or not a Supreme Court nominee had been confirmed in a presidential election year before. Dickerson corrected him, saying that in 1988, Justice Anthony Kennedy had been confirmed, though he was nominated the previous year. "Obviously the war in Iraq was a big, fat mistake"
Then, something happened that no one expected in a Republican primary debate — the party&apos;s frontrunner went on a scathing attack against the previous GOP incumbent over national security. "Obviously the war in Iraq was a big fat, mistake," Trump thundered when he was asked about his own foreign policy. "They lied — they said there were weapons of mass destruction." His attack on George W. Bush was met with loud boos from the crowd in Greenville, S.C. — a state where the former president still remains very popular — and provoked a strong defense of his brother from Jeb Bush. "I&apos;m sick and tired of Barack Obama blaming my brother for all the problems he&apos;s had," the younger Bush said. "While Donald was filming a TV show, my brother was busy keeping us safe." Trump jabbed back that Bush didn&apos;t keep the country safe: "The World Trade Center came down during your brother&apos;s reign, remember that." "On behalf of me and my family, I thank God all the time it was George W. Bush in the White House on 9/11 and not Al Gore," Rubio interjected in a rare moment of defense toward Bush. "The World Trade Center came down because Bill Clinton didn&apos;t kill Osama bin Laden when he had the chance to kill him." The outspoken reality TV star has faded into the background at some recent debates — something that probably helped more than hurt him. But tonight he was front and center, and not in a good way. It was more than just his tiff with Bush over 9/11. The two later tussled again when Bush pointed out the bankruptcies Trump&apos;s companies had filed for — and Trump kept interrupting and talking over both Bush and Dickerson, calling Bush a liar and saying he personally never filed for bankruptcy. When he asked by Dickerson about his profanity, Trump defended his use of often vulgar language as something he did "on occasion, in order to sort of really highlight something." And he added that previously when he&apos;d been bleeped out for allegedly using the F-word, he had not actually said it. Using another odd strategy from last week, Trump again attacked the audience when they booed him when he went after Bush and also insulted South Carolina Sen. Lindsey Graham, a former presidential candidate. "That&apos;s Jeb&apos;s special interest and lobbyist talking," the boisterous billionaire said as he tried to explain away the jeers. When Cruz attacked him for supporting Planned Parenthood — which he fired back at him calling the Texas senator "the single biggest liar" — Trump then did say supportive things about the group reviled by Republicans. Trump reiterated that while he didn&apos;t support taxpayer funded abortions, the women&apos;s organization does do "wonderful things having to do with women&apos;s health" — another frequent argument by Democrats. One of the more puzzling moments was when Trump brought up — unprompted — his support for eminent domain, something that&apos;s put him at odds with many Republicans and has been a frequent point of attack from his GOP rivals. Overall though, Trump was thrown off his game and was on the defensive for most of the night. He&apos;s ahead in the polls in South Carolina, but debates have changed the course of the race there before and could again. 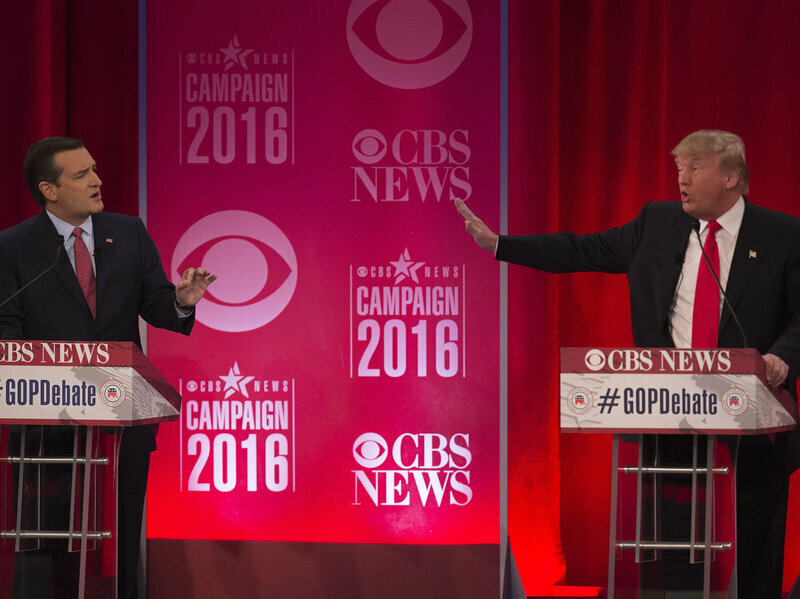 Rubio vs. Cruz: "He doesn&apos;t speak Spanish!" There are big divides in the GOP on immigration, beyond just Trump&apos;s heated rhetoric and his repeated exhortations that Mexico will pay for his vaunted border wall. Cruz and Rubio had the biggest dust-up on immigration of the night, with the Texas senator again pointing out what many see as the Florida senator&apos;s Achilles heel — his onetime support for the Senate&apos;s comprehensive immigration reform bill. "In the state of Florida, as speaker of the house, he supported in-state tuition for illegal immigrants," said Cruz. "In addition to that, Marco went on Univision in Spanish and said he would not rescind President Obama&apos;s illegal executive amnesty on his first day in office." Rubio&apos;s retort: "Well, first of all, I don&apos;t know how he knows what I said on Univision because he doesn&apos;t speak Spanish." Cruz responded by unleashing on a tear in Spanish. But Rubio had an opening and took it, painting Cruz as unethical and hitting him for suggesting on the night of the Iowa caucuses that Ben Carson was dropping out of the race. Overall, the Florida senator, who had a disastrous debate just a week ago, had a much stronger performance this Saturday night, which he badly needed to stay alive in South Carolina. Kasich wants to be the adult in the room: "This is just nuts, OK?" The Ohio governor wanted you to know on Saturday night he&apos;s a uniter not a divider. Kasich, who surprised this week with a strong second place finish in New Hampshire, repeatedly spurned the infighting that was enveloping him on stage, exhorting his rivals to calm down and come together. "I think we&apos;re fixing to lose the election to Hillary Clinton if we don&apos;t stop this," he said, somewhat exasperated, at one point. When asked by Dickerson to weigh in on the Bush/Trump spat over 9/11, Kasich channeled what many people at home were probably thinking: "This is just nuts, OK?" Kasich is trying to keep running a positive campaign — something he&apos;s credited for his Granite State win — but that&apos;s becoming harder to do in such a negative, bitter race. "Look, the bottom line is the people of this country and this state want to see everybody rise, and they want to see unity, and I don&apos;t want to get into all this fighting tonight because people are frankly sick of the negative campaigning," he argued. But in a year where voters are angry and it&apos;s that frustration that is fueling the rise of an outsider like Trump, can Kasich&apos;s sunny message or unity work? It will be hard. As he has been in nearly every recent debate, the retired neurosurgeon was a non-factor. He got more questions earlier on than usual, but he repeatedly used them to jump in and answer a question ... from 15 minutes ago. When he was asked about whether he was capable of handling "2 a.m. phone calls" in the White House — he instead rewound back to further expound on his answer about the Scalia vacancy and the need to end lifetime appointments. When he was asked about how he would deal with ISIS, he decided to weigh in on the Iraq war tiff between Bush and Trump. And his rambling answer on his tax policy was cut off by Dickerson telling him, "I&apos;m sorry we have to go to a commercial. The free market wants what it wants." Carson was once the rising outside candidate, but that was months ago. He finished last among the current field in New Hampshire, and if he does poorly again in South Carolina, a state his candidacy and message should have a broader appeal, it will be even harder to make a rationale for his candidacy.